Damn the drum « Hercules and the umpire. Long before the Mad Hatter, Charlton Heston,* lost his memory and his mind, the NRA had morphed from a group that my son and many other young people depended upon to learn how to use a shotgun safely when hunting, into a coldly sinister foe of cops like Omaha Police Officer Kerrie Orozco. Before you read any further take a look at the following photo. Even though it will torch your soul, do not avert your eyes. 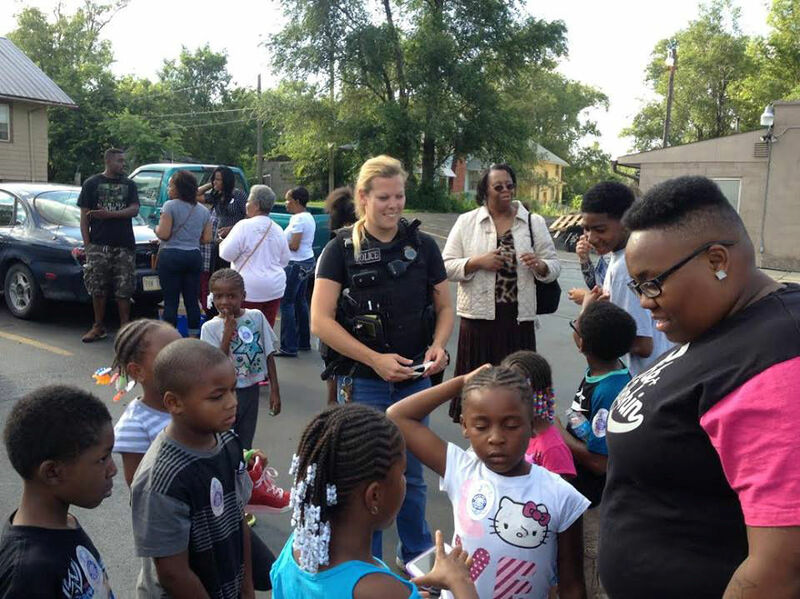 The living, breathing, white woman who was cop, a mother, a wife, and a loving person who cared deeply about little black boys and girls, is dead. Her infant daughter will never know her. No abstraction. She is dead and gone. Now, consider the fact that when this young officer and fellow officers got into the shootout, Mr. Wheeler, the fleeing felon, fired a Glock 9 mm handgun** with a 50 round drum magazine at the officers. See Transcript of Police Chief Todd Schmaderer’s remarks at Thursday press conference, Omaha.com Posted: Thursday, May 21, 2015 6:34 PM). A drum magazine? What the hell is that? I don’t know whether the 50 round drum magazine made any difference at all. But I do know this, cops should never have to face add-on magazines of any capacity when attached to semi-automatic pistols. Don’t give me any BS about the Second Amendment. Don’t make the untrue and shopworn argument that “criminals will always have access to such magazines even if we ban them and therefore regular folks will be left defenseless.” That too is BS. Pending in Congress is a bill to limit high-capacity magazines. Gabrielle Levy, Gun Control Advocates Try Again on Ammo Limits, US News and World Report (Feb. 6, 2015). Additionally, and more importantly, the United States Court of Appeals for the 7th Circuit has very recently held, among other things, that it is OK to ban “semiautomatic pistols, [with] the capacity to accept a magazine outside the pistol grip.” Friedman v. City of Highland Park, No. 14–3091, — F.3d —-, 2015 WL 1883498 (7th Cir., April 27, 2015). Apparently there are still a few sane people in this deeply troubled country. **The Omaha police do not use 9mm handguns. It is now clear that the dead officer died of bullet from Wheeler’s handgun. A bullet from a 9mm handgun went through her chest and lodged in the back of her ballistic vest. See Transcript of Police Chief Todd Schmaderer’s remarks at Thursday press conference, Omaha.com (Posted: Thursday, May 21, 2015 6:34 PM) and linked above. Judge, thank you for your willingness to call a spade a spade. My heart absolutely aches for the family and friends of the officer, and especially for her little girl. Judge, your dead on (sad pun intended). The deification of guns in this country is absolutely frightening. Islam has ISIS; we have the NRA. Thank you for having the courage to talk selse. Thank you so much, Judge Kopf, for speaking out against the insanity that is the current gun lobby. Today’s NRA is not the NRA of yesteryear. It’s important to note that the NRA has endorsed a bill that has made it through the Nebraska Legislature’s Judiciary Committee and is relevant to this tragedy. LB289 is a “preemption” bill that deprives city governments from passing their own firearms ordinances. It will nullify ordinances in Lincoln that prevent stalkers from owning guns in city limits and prohibit people from carrying guns into domestic violence shelters. It will do away with all of Omaha’s gun ordinances, including the requirement that people who open carry pass any kind of training whatsoever. Shockingly, Omaha’s mayor, who accepted thousands of campaign dollars from the gun lobby, has supported this legislation. This would mean that not now, not ever could Omaha’s city government pass ordinances that they feel would help address the city’s gun violence problem. The madness you describe above begins with the gun lobby but requires complicit politicians and inattentive voters to actually become reality, and we are watching it unfold before our eyes in Nebraska. I’d encourage readers of your blog who are concerned about gun violence in our state to raise their voices about this “New NRA” bill. What Ms. Gailey said above is so deeply troubling, especially given the circumstances Omaha finds itself in currently. Even more troubling, is the support LB289 has found in small minded local leaders such as Mayor Jean Stothert of Omaha, and Mayor David Black of Papillion. By stripping a city of its ability to enact locally specific ordinances to address their individual problems, these mayors carelessly deny the possibility that future needs may dictate policies to protect specific communities. Thank you for a wonderfully frank, heartbreakingly real post. That a provision of the Bill of Rights designed to limit the power of Congress to regulate the militia was extended to the States demonstrated the intellectual bankrupcy of the self defense reading of the Second Amendment but damaged will be limited if ahistoric 5 originalists on SCOTUS accept the 7th Cir. approach. Judge, I respect you, but you’re wrong. A high capacity magazine holding 50-rounds of 9mm did not slay Officer Orozco, Marcus Wheeler killed her. According to several news reports, witnesses heard 5-10 shots, total (and the police stated that Wheeler fired 9 rounds). The drum magazine had no impact on Officer Orozco’s death. In addition, Marcus Wheeler was a felon, having served time in federal prison for possession with intent to distribute cocaine after violating his probation. Felon’s are prohibited from possessing firearms to begin with. So let’s look at Wheeler for a minute. He was revoked for violating his probation. Allegations included taking 10 shots at an individual who was in her vehicle, but the U.S. Attorney did not pursue criminal charges for that violation. He was alleged to have Molotov Cocktails in his possession, which are destructive devices and prohibited under federal law, but the U.S. Attorney did not pursue criminal charges for that violation either. He was alleged to be a felon in possession of a firearm, no charges there either. Instead, U.S. District Judge Joseph F. Bataillon sentenced Wheeler to 12 months, 1 day for the drug probation violation. If you are looking for something to blame for this young officer’s death, you do not need to look at the drum magazine that Wheeler possessed. You need look no further than the U.S. Attorney’s Office and the United States District Court for the District of Nebraska. I would be happy to join you in your quest however, with one proviso. Every restriction that you place on the general public would also apply to the police. 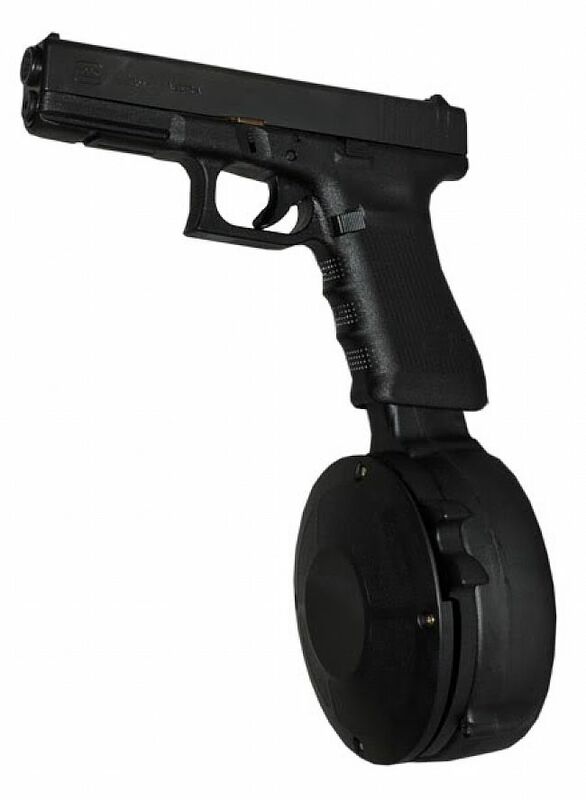 If the general public does not need drum magazines, then neither do the police, for the police have no greater right of self-defense than the general public does. *As an aside, I would actually rather face someone using a Glock with a drum magazine than the normal 15-round magazine. It’s harder to shoot accurately with the drum mag. If you noticed, on the sarcastic video on the drum mags, when he shot them, he wasn’t aiming and he did not show the targets. Spray and pray is not a very effective way of fighting with guns, and I would be less likely to be hit than with someone who is actually taking the time to aim. Thanks. As a former cop, I deeply respect your views. But, I don’t think many folks in blue would agree with you. Besides the policy arguments, you really don’t believe the Second Amendment applies so as to prohibit such a ban, do you? If you do, read Judge Easterbrook’s opinion again. Thanks my friend. All the best. Does anyone seriously contend that the Amendment provides a constitutional right to own a main battle tank, or Stinger missiles? If not–and I think I’m safe in saying that no one competent to care for him- or herself does–then it’s all about line drawing. There are too many guns out there, and so people like Wheeler will get one whenever they want. There are so many guns that it’s easy to say that taking them off the streets or limiting who may possess guns of certain kinds won’t do any good. But we have to start somewhere if we are going to change our violence-mad culture. So you don’t know if the drum mag made any difference, but it’s evil and lets ban it? Your proposed ban on “add-on” magazines would be a welcome change for some of us who can’t even get magazines to fill the grip, much less “add-on”. The MA legislature made the arbitrary decision that 10 rounds was all any honest person would need, but then cops are allowed to possess these not only for employment purposes, but off duty and in retirement in MA. See M.G.L 140 § 131M. So are cops special, are they dishonest, or is there really a self-defense need that “add-on” or “large capacity” magazines fill that you, and those who agree with your position, simply deign we plebs are an acceptable loss if we suffer the consequences of having that need go unfulfilled? Lets look more at Highland Park. As you say, it upheld the ban on “semiautomatic pistols, [with] the capacity to accept a magazine outside the pistol grip.” So it’s perfectly acceptable to have a 10 round magazine inside the pistol grip, but completely unacceptable and a danger to society if that magazine mounts outside the pistol grip? That doesn’t even pass rational basis, much less any elevated scrutiny. If it has no other effect, Highland Park’s ordinance may increase the public’s sense of safety. Mass shootings are rare, but they are highly salient, and people tend to overestimate the likelihood of salient events. See George F. Loewenstein, Christopher K. Hsee, Elke U. Weber & Ned Welch, Risk as Feelings, 127 Psychological Bulletin 267, 275–76 (2001); Eric J. Johnson, John Hershey, Jacqueline Meszaros & Howard Kunreuther, Framing, Probability Distortions, and Insurance Decisions, 7 J. Risk & Uncertainty 35 (1993). If a ban on semi‐ automatic guns and large‐capacity magazines reduces the perceived risk from a mass shooting, and makes the public feel safer as a result, that’s a substantial benefit. Cf. Frank v. Walker, 768 F.3d 744, 751 (7th Cir. 2014). The deaths of mothers, fathers, daughters, sons, sisters and brothers is a tragedy that plays out across the nation every day. Proportionally for every murder committed by a murderer with a gun, another person is killed by other means and two people kill themselves with a gun while two more commit suicide by other means. Three people die in auto accidents. Almost 10 people are killed by medical malpractice. Most of these deaths are equally unconscionable and preventable, yet folks have determined that morally, the one murder and two suicides committed with guns are special, 100% preventable with a ban on citizen possession of guns (ie; these deaths won’t be replaced with others using alternative means or black market guns) and “worth” the costs to our liberty. I didn’t know, or know of, Officer Orozco until yesterday. I am sorry for the loss suffered by all who knew her. But there are other people whose families aren’t suffering today because of citizen possession of arms including the so called “large capacity feeding devices”. As the retired cop and current lawyer so ably demonstrated, there is plenty of blame to go around on why this societal deviant was even on the street. I am not a retired cop, nor am I a judge, lawyer, legislator or otherwise favored member of society. But IMHO, blaming pieces of steel and plastic strikes me as a convenient means for ignoring the many other failures that went into creating the situation that saw Officer Orozco killed. DO NOT ASSUME THAT I DON’T WANT A MAIN BATTLE TANK. You are talking about my liberty after all. Besides, US M1A2 Abrams Main Battle Tanks absolutely are coolest thing on the planet. I agree that the current state of the law clearly allows such limits on magazine capacity, however, Judge Manion’s dissent is actually better reasoned, IMO, than Judge Easterbrook’s (as much as I hate to say that, since I normally love his opinions). My personal view is that if a weapon is appropriate to the militia, it is authorized to the public. See English v. State, 35 Tex. 473, 476 (1872) (“The word “arms” in the connection we find it in the constitution of the United States, refers to the arms of a militiaman or soldier, and the word is used in its military sense. The arms of the infantry soldier are the musket and bayonet; of cavalry and dragoons, the sabre, holster pistols and carbine; of the artillery, the field piece, siege gun, and mortar, with side arms.”). These are the weapons that should be available to the public, the current sidearms that our military carries. It can be done – in Switzerland, there is a SG550 fully auto rifle in almost every home. But we all know that my personal view is not the state of the law. On the other issue, most police officers do not support gun control. PoliceOne did a poll (unscientific) on gun control involving over 15,000 officers. On high-capacity mags, 95% of officers felt that a ban would not reduce crime. As far back as 1997, 82% of officers in San Diego opposed a high-capacity magazine ban, believing it to be ineffective. I am very confident that most of the actual street officers believe as I do on this. Magazine bans do not work. “An armed society is a polite society. Manners are good when one may have to back up his acts with his life.” Robert A. Heinlein, Beyond This Horizon (1942). We need more guns, not fewer. When a client says “I want,” I often reply, “I want a Rolls-Royce, but I drive a Volkswagen.” OK, you want an MBT, but do you have a right to one? I confess that I don’t want a tank. I want a Spitfire. I don’t see how you can reconcile the Second Amendment with the drum ban. The purpose of the Second is to empower the people to mount credible resistance to a foreign or domestic tyrant, and the purpose of a right defines its scope. During the Revolution, ordinary citizens owned cannons. If anything, using the Framers’ standard, our gun laws are already too restrictive. The death of Officer Orozco is tragic. But hard cases make for bad law. You sound a lot like the Catholic nuns you lampooned. It would be nice if we could do away with nukes (drums), and all sing Kumbaya, but it is not realistic. Great smark about the nuns. Good for you. The saddest reality is that Mr. Wheeler — and anyone like him — should not have had ANY firearm, bow and arrow, slingshot, or any other weapon intended to wound, maim, or kill. How do we even begin to keep these weapons out of the hands of anyone who should not HAVE any of these weapons? I have yet to hear any rational thought on this aspect of the problem. I would invite yours. Maybe we can all chip in and donate money to send Big Daddy to Iraq to help out with his two fisted guns with the fifty round drums. I’m assuming he’d be willing to go. I wonder how long he’d last against ISIS… But at least he’d go guns a’ blazing. I don’t have a problem with sportsmen who hunt (as long as they eat what they kill) or folks who like to target shoot. I don’t think its smart to keep a handgun for self defense in your home (just my personal opinion), but if you want to do so (and kids can’t get at it) then okay, it’s your right. But why does anyone need an AR-15? I’ll keep Officer Orozko in my thoughts and prayers. But you’re just going to unduly aggregate yourself posting about rational gun control. 26 victims in Sandyhook, ( my wife grew up there- such a wonderful small town), almost all of them small children. Our Governor has gotten behind legislation to place restrictions on assault rifles. You should see the number of people opposed to it. Right here in Connecticut… After an event like that… You just can’t fix stupid. Now I’m becoming unduly aggregated. I gotta watch out for that- high blood pressure you know. Then stay there . . . . . I’ve been there, too. I left . . . .
Then, by all means, stay there! I’ve been there, too. I left . . . . . .
You are in France (once, I went there in my dreams when BB and I were young). You are a terrible name-dropper. Eat some French fries, or as I like to say Amerikan fries, for me! My take is quite simple. The First Amendment does not include any qualifying clause, it simply says that Congress shall “make no law” restricting any of the rights recognized in the First Amendment. Yet, courts have found that a state or Congress may enact reasonable “time, place, and manner” regulations. If reasonable regulations are permissible for an unqualified right in the First Amendment, why are they not permissible for the qualified right in the Second Amendment. No, your honor, short of being attached to a Glock 18 on full auto, drums —like Desert Eagles, bump firing, Saigas, etc. —aren’t something that the most folk in blue (polyester or worsted; not to mention those in tan, green, and deepest tactical black) are losing sleep over. For many reasons. You got me. I have no idea why reasonable regulation of guns is even controversial. It is clear both as a matter of history and tradition that the government has the power to impose reasonable conditions on guns and gun accessories under the Second Amendment and otherwise. Judge Manion maybe stranger than his father, was 1872 TX Ct in touch with founders otherwise what is the relevance under supposed approach of majority in DC Case? Strange how few friends federalism has where guns are concerned either on the right or the left. Criticism of France seems strange following a quote from Heinlein given his fixation on the bidet, or were those who left France unable cooperate that appliance. Well, I guess since Justice Scalia cited English in Heller there must be some relevance as to what the interpretation of the law was…. Scalia is not particularly consistent in his historicism, a case in 1870s could not be relevant to contemporary meaning of text at adoption, and the TX CT at the time is hardly a source for historical studies .Law office history is the curse of 2nd Amendment discussion. I am so glad you are here to let all of us know how inconsistent Scalia is and how that has anything to do with either my opinion or your view of the law. My view on the course of 2nd Amendment case law is ask Kennedy, though tea leaves might work. To call opinions on this subject legal opinions is praise they do not deserve. SCOTUS launched the tour but the guidance is dim. Used to belong to the NRA and when younger and uninformed would have agreed with Supreme Court decision but then I read the Federalist Papers and a very good bio of George Washington. I then realized that the Militia amendment was part of the bill of rights to appease George who wanted a strong central army because of his experience with the rag tag militia he commanded. Many showed up with no firearm. No uniform. No training. This amendment was designed to assure George that if and when the Militia was needed it would be well armed and trained, one might say ‘well regulated’. Thus a large standing central army was not necessary. I no longer belong to the NRA. And alas, the ‘Supreme’ court’s stumble is not limited to this case. Enough said for now. LawDog, can you reconcile the Second with a ban on fully auto handguns? Or a M249 LMG? Or RGK’s tank, referenced above? Of course you can.